Only lazy programmers will want to write the kind of tools that might replace them in the end. 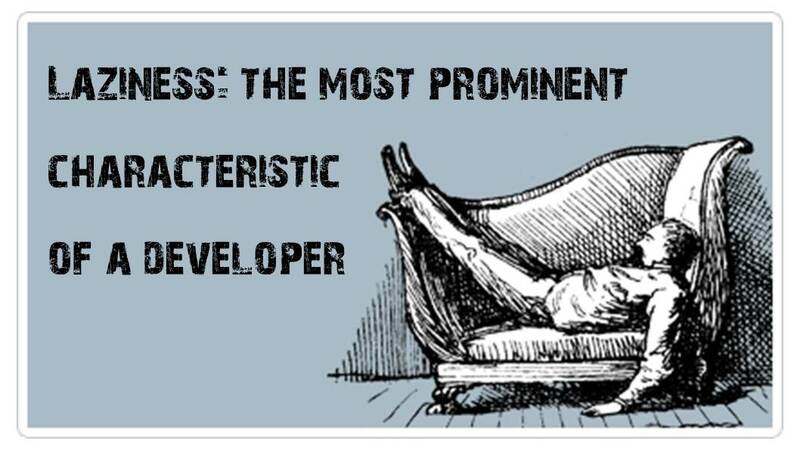 Lazy, because only a lazy programmer will avoid writing monotonous, repetitive code – thus avoiding redundancy, the enemy of software maintenance and flexible refactoring. Mostly, the tools and processes that come out of this endeavor fired by laziness will speed up the production. Validating, compiling, minimizing, concatenating and the list goes on, these are the tasks you need to do before releasing your library to the wild. That’s what Grunt aims to be. It has a bunch of built-in tasks that will get you pretty far, with the ability to build your own plugins and scripts that extend the basic functionality. 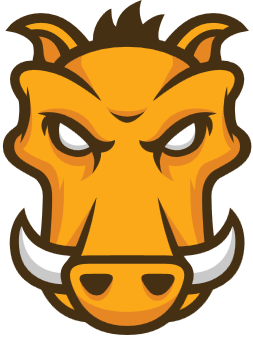 For more Grunt intro goodness, see Ben’s post on his personal blog and the Bocoup blog. So, now you are sold and your project is fully automated in just about few minutes of work, now what? Well, now it’s time to distribute it to the people. That’s the whole point of software anyway, we want people to use our stuff. The Grunt ecosystem is huge and it’s growing every day. With literally hundreds of plugins to choose from, you can use Grunt to automate just about anything with a minimum of effort, that’s exactly what I decided to do. I’ve written a grunt plugin which will help you share and distribute your project to Bintray and from there to the rest of the world. With Bintray you know how your library is being consumed. Not only do you get download stats per version, but users are also able to communicate with you; comment and rate your libraries; or otherwise give you feedback. 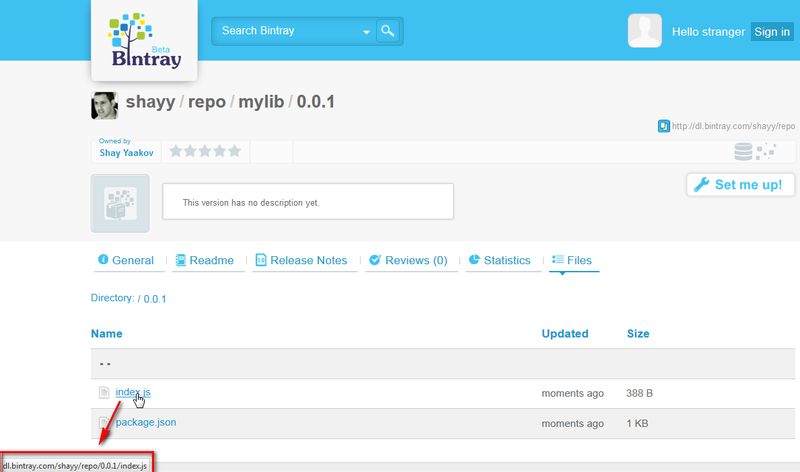 Now let’s configure the task to publish our index.js and package.json files to Bintray! 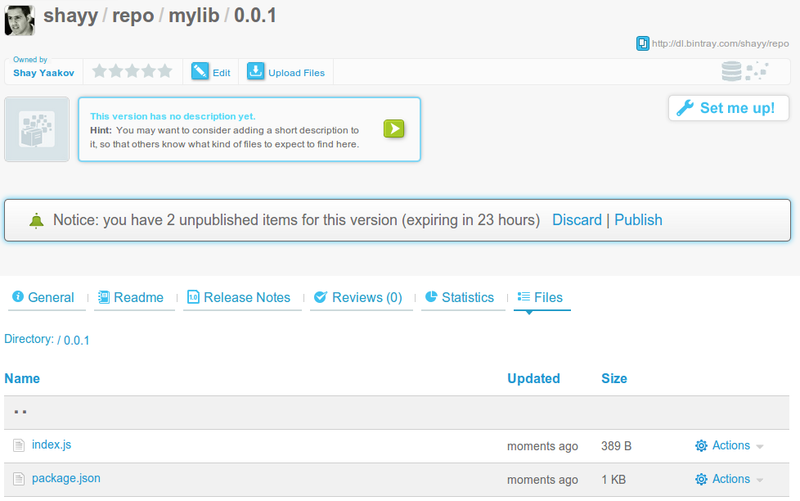 >> Successfully created new package ‘mylib’. Now that everything is automated, we can finally go taking a nap and leave our CI server to do this nasty job.